Chanukah Dreidels (Tops) are a tradition going back to the beginning of Judaism. The tops have 4 Hebrew Letters. Shin, Nun, Gimel & Hay. Standing for A GREAT MIRACLE HAPPENED THERE. In Israel the letters change to A Great Miracle happened here. When the Temple In Jerusalem was destroyed. The Jews returned to light the eternal Lamp and the oil lasted for 8 days instead of one. See my Jewish Fun or my Jewish Parent page for more on the Holiday. 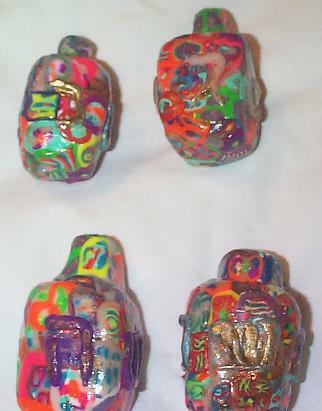 See my Clay page for rules of handling polymer clay. For more Chanukah craft ideas see ShalomBoston.com's Chanukah edition 2000. It features an article I wrote. Look for a Chanukah 2001 article. See my new Chanukah Pages Original Crafts and more! Links to many other Chanukah sites. Assorted Sculpey3 cane slices or other commerical slices. Or see my Clay page on how to make canes. Sculpey Glaze or Future Floor Wax. Pryrex dish or metal cookie sheets. Pasta Machine. (optional) or small clay rolling pin. Size of dreidel is up to you or your budget. Take aluminum foil and rip off a large sheet about 12 inches long. Squeeze into ball and move some of the foil into the stem. Flatten into 4 sided square and leave a point on bottom of form. Roll out the white Sculpey or use Pasta Machine in a sheet 1/4 inch thich and big enough to cover the aluminum foil. Flaten the dreidel until you have 4 flat sides. Add Cane slices until the white is covered. Roll in your hand to smooth the canes together. Take polymer clay scraps and roll into thin snakes and form the letters. Press gently one on each side. Brush on Sculpey glaze: Matte, Gloss. Or use Future Floor Wax. 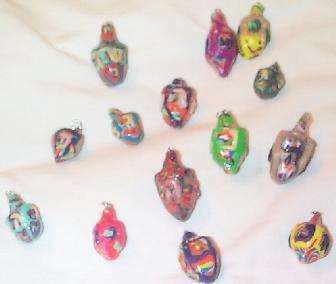 The same technique can be made in minature for dreidel charms for necklaces and earrings. It is very hard though to make two perfectly matched ones for earrings... but it is possible. Before baking put jewelry metal pin with loop into clay. Jump ring can be added after baking. Dreidels can have themes too! Canes of one type can be used. I did a great one with all face canes. The commercial canes come in many different designs: Flowers, frogs, rainbows etc.. Have fun! COMING SOON HOW TO MAKE FILAGREE CLAY DREIDEL JEWELRY! To see/buy Dreidels and Dreidel Jewelry of Polymer Clay or Friendly Plastic go to our sponsor.